Olive Hill, Kentucky calls itself "a nice place to call home," but music lovers and outdoor enthusiasts call it a nice place to visit. Because of its small-town Americana charm and proximity to some extraordinary trailways, Olive Hill was recognized as the fourth official "Kentucky Trail Town," a program by which Kentucky communities build identity upon hiking, water, or railway trails. Olive Hill has all three. Tygarts Creek flows through downtown, carving a natural gorge upriver and downriver from Olive Hill. Carter Caves State Resort Park, one of Kentucky’s oldest parks spanning 1,800 acres and with 30 miles of hiking trails, is just seven miles north of town. And in its infancy, Olive Hill was a bustling railroad town that was the largest producer of fire bricks in the world during a boom in the 40s and 50s. Today, Olive Hill is claiming its identity and finding renewed pride as a destination for music, community fun, and outdoor adventures, with the historic Depot Trailhead in downtown Olive Hill standing as a welcoming link between the past and present. The town recently restored the 1885 Depot into the "Trailhead" facility which now regularly hosts community events, live music, market days, and other activities. The mostly paved 8.5-mile Green Trail connects the Depot Trailhead to Carter Cave State Park, or paddlers can float 12.5 miles from the Depot to Carter Caves State Resort Park on Tygarts Creek. The nearby Olive Hill Center for Arts and Education, a former school building restored and now programmed by the Olive Hill Historical Society, houses musicals, dinner theaters, and meetings. As the welcome signs will tell you on the way into town, Olive Hill is the birthplace of country music icon Tom T. Hall, and music seems to be in the air. Solo performances and old-fashioned bluegrass jam sessions are regular occurrences at the Depot Trailhead, whether planned or spontaneously arising at the community firepit. Carter Caves State Park once hosted the International Strange Music Festival, who was an idea dreamed up by Park Naturalist John Tierney. The festival boasted music made by things that are not intended to be instruments, like jugs, toilet seats, an upside-down table, a calliope of car horns, etc. It wasn’t as popular as Tierney had hoped, but the musical tradition continues at the park with the Fraley Festival of Traditional Music. Started in the 70s and is still going strong the each year on the first weekend after Labor Day, the festival pays tribute to the musical heritage of Eastern Kentucky with banjos, fiddles, and dulcimers. 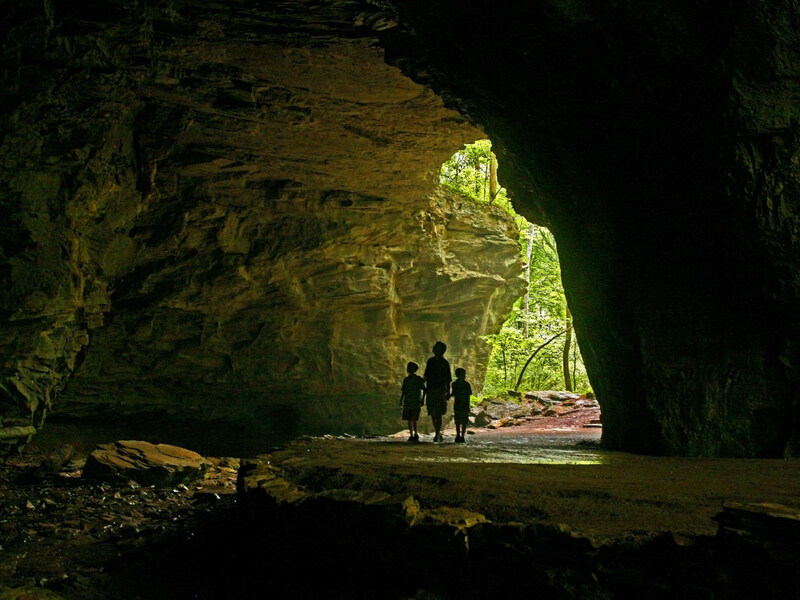 As the name suggests, the caves are the biggest draw to Carter Caves State Resort Park. Some of the most impressive caves in the state are found here, and four are open to the public. There are several guided tours offered, ranging from kid-friendly to strenuous crawling through small cave passages. In addition to the cave tours offered at the park, there are plenty of opportunities for exploring the outdoors. Go paddling on the beautiful 46-acre Smoky Valley Lake or climb the sandstone cliff line. Climbing and rappelling permits can be picked up at the front desk of the lodge. 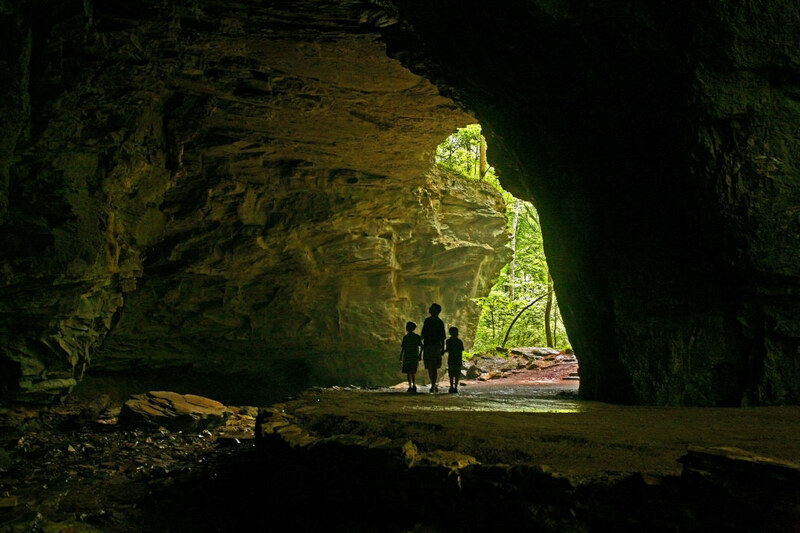 There are also 26 miles of wooded nature trails winding around the caves, featuring several arches and rock houses, caves, bluffs, the view of Smoky Valley Lake, swinging bridges, and terrain similar to Red River Gorge or Big South Fork. In fact, Blue Ridge Magazine recently named Carter Caves Trail System among its "Best of" 2017. The Carter Caves Cross Country Trail, known as 4Cs, is a 7.8-mile loop that partly overlaps into Tygart State Forest. 4Cs, combined with the small Raven Rock Side Trail, gives hikers a view of three sandstone arches and Smoky Valley Lake. Its length makes it a long day hike or an easy overnight hike if you stay overnight at the Johnson Homeplace Backcountry Campsite. Caves aren’t the only attraction around here - the area also has several arches worth visiting. The Shangri La Arch is shaped like a long, natural funnel, and even though it’s only six feet tall and eight feet wide, it spans roughly 50 feet in length. There is another stone arch along the blue-blazed Raven Bridge Trail, which can be accessed from the 4Cs just across the Smoky Valley Lake Dam. Fern Bridge is the largest arch along the 4Cs, stretching nearly 150 feet and rising 84 feet tall. You’ll find it in between the entrance/exit of Raven Bridge loop and the 4Cs trailhead. Carter Caves State Park also shares the 10-mile Kiser Hollow Multi-use Trail with Tygarts State Forest. The trail begins at the riding stables within Carter Caves Resort State Park. Olive Hill has several familiar chain restaurants like McDonald’s, Subway, and Dairy Queen. But if you want to eat local, stop in at Walker’s Family Restaurant. With options ranging from crispy chicken fingers to tasty burgers, it’s a great spot to get a good meal. They have other sandwiches and daily plate specials as well. If you’re in a hurry or want something to take back to your campsite, just order to go. If you’ve worked up an appetite for barbecue from hiking or paddling all day, the 10-mile drive to Pure Pit Barbecue in neighboring Morehead is worth your trip. They’re known for pulled pork, smoked turkey, melt-in-your-mouth brisket, and ribs. Go ahead and order a side of "ugly cheesy taters" just for fun. If you’re in the mood for pizza, Tyler’s Pizza is the spot for pizza, wings, salads, subs appetizers, and breadsticks as well as daily diner-style lunch specials. Top it off with a scoop of ice cream at Katie’s Corner inside Med-Save Carter Pharmacy. Got a sweet tooth? Head to Sweet Sensations bakery for donuts, cakes, pies, and more. Olive Hill might be a small town, but it has a lot to offer. But don’t take our word for it - come see for yourself! Written by Danny May for RootsRated in partnership with Kentucky Tourism.